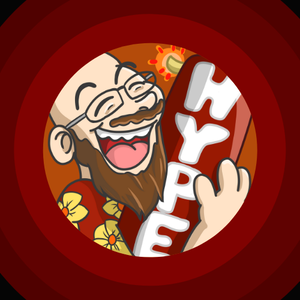 A streamer who loves gaming, old-school radio, television, and film, Hawaiian shirts, and beard. In a world where negativity reigns supreme on television, one man stands alone against the world and entertains the masses with his professional Fortnite gameplay and beautifully dyed hair. I am NOT that guy. Hello, my name is Kyle, thank you for stopping to take a look at my profile. I may not be a professional gamer, but I play games as often as I can in my spare time. You ever have that moment that you think, "this would be so cool/hilarious/sticky if other people saw that?" It happens, and it's my hope to capture those moments with you. I also love meeting, chatting, and playing with new viewers and streamers, and it's my hope you'll enjoy what I have to offer: beautifully adequate gaming with my personal old-school broadcasting touch. So, have you got something on your mind? Looking to bond over video games? Need your car washed*? Check out my channel! *I cannot promise to wash your car. What DON'T I do? I work full time, I am a psychology major in my second year in college, I'm a full-time parent of an awesome little guy, and I stream or make other content in whatever spare time I have left. Gaming has been a large part of my life since I received a Super NES for my 8th birthday. From my high school days of playing Grand Theft Auto in my best friend's basement, to my Marine Corps days of getting together with my platoon and playing Battlefield 3, to (accidentally) turning a friend's Minecraft masterpiece into a giant crater, many of my favorite memories are rooted in gaming. My best streams happen when I'm interacting with viewers and IRL friends; it's my hope that you find some entertainment in them as well. Stop on in, let me know what's on your mind! While I play a wide variety of games, for streaming I plan to focus on survival-shooters and survival-strategy games, and I also tend to play a lot of Battlefield. But as they say, I'll try anything once! As the focus of my channel is on community interaction, I would love to gain a following and, perhaps, host a talk show one night a week where we talk about, well, whatever the viewers want! It could be gaming related, sports related, even posting makeup tips! I mean, I'm a bald headed dude with a beard, so I can't say they'd be very good, or land anyone a date, but eh, it might be fun to try! As part of my streams, I pose a question to my viewers called the "AskReddit Question of the Day." These questions tend to fall on the gaming related side, but I may ask something that I think viewers find interesting. On top of that, I usually talk about whatever comes up, including upcoming game releases, news, and hot gameplay tips (that I don't suggest anyone use ever). While streaming, I often choose to include audio from whomever I'm playing with. I'm not afraid to ask the tough questions (such as their views on existentialism, the Pythagorean theorem, or how to stabilize the modial interaction on a retro encabulator). My best experience as a viewer was watching the Mister Rogers' Neighborhood marathon. As an adult, I learned quite a bit, and you bet I watch the Mister Rogers 24 hour marathon streams with my son. I'm 100% serious. -NeebsGaming is BAE. I started on Twitch because of their outstanding content; I was inspired and thought creating content was something that I could get into. -NubbinsInc is a team of variety streamers, one of whom I have known IRL for several years now. They showed me how fun Twitch streaming could be. -OldManRenz is a streamer I found one day while browsing -- he started out streaming from the potato Twitch app, just as I did. He also introduced me to the Factionless community, a close knit group of viewers and streamers and a generally awesome group of people to hang out with. -Beardly357 is a Diablo 2 streamer that I met through the Twitch subreddit. I've never played Diablo 2, but the guy plays really good music and he's a good guy with a community that I really enjoy being a part of. There are so many other awesome streamers that I hang out with, but these four are the ones that really inspired me to be the streamer I am today. Looking for other streams? Just ask. Report WileyStyleKyle's profile for containing a lack of content. Report WileyStyleKyle's profile for containing unsafe links. Report WileyStyleKyle's profile for containing offensive content. Report WileyStyleKyle's profile for containing formatting errors. Report WileyStyleKyle's profile for containing invalid links. Report WileyStyleKyle's profile for another issue.